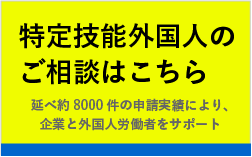 AOYAMA OFFICE is certified administrative procedures legal specialist office, especially immigration procedures. We are available for customers from all over the world. We are specialists to get status of residence in Japan (VISA) for foreigners.We will provide you extensive immigration consulting and documentation services in English and Japanese.Please feel free to contact us to find the best way to resolve your problem. For the foreigners who live in Japan. To start a business or invest in Japan. When you want to get married to a Japanese national. When you want to get Japanese nationality. Besides of that, we can provide you with various supports, establish a company in Japan, claim the subsidy and negotiation with a public office, etc.From the aspect of the Japanese law, we provide you comprehensive support for a foreign company to do business in Japan. The number of application for certificate of the eligibility and other applications to the immigration bureauin 2015 is about 3300 applications. Our office’s map, please download from here. Copyright (C) 青山行政書士法務事務所 ALL Rights Reserved.